The Society for Peace Unity and Human Rights for Sri Lanka (SPUR), encourages all parties embroiled in the struggle for political supremacy in Sri Lanka to respect the authority of the Executive President, Maithripala Sirisena and abide by the rulings given by Sri Lanka’s Supreme Court. SPUR condemns the blatant interference of the European Union, Britain, the United States and a number of other countries who erroneously believe Sri Lanka to be a colonial state under their rule, forgetting that we have been an independent nation for the last 70 years. These so-called guardians of democracy have been joined by a few international agencies and a bunch of tin-pot civil society organizations, who couldn’t muster a crowd to fill a dozen Tuk-Tuks plying on Sri Lanka’s roads. While speaker Karu Jayasuriya is crafting a constitutional crisis blatantly violating the law challenging the authority of the President. In addition, we wish to point to the international community, United Nations and the Commonwealth Secretariat, who are like Flint on matters related to Sri Lanka, that they continue to be silent on the plight of the neighbouring Buddhist country Thailand, where a military junta has been interfering in democracy since 2006. To the contrary, the biggest US force in years joined an annual military exercise in Thailand on 13 February 2018, despite controversy over the Thai junta’s invitation to neighbouring Myanmar’s army, which has been accused of ethnic cleansing in the United Nations. This breathtaking hypocrisy and blatant disregard of decency condemns the United States and its lackeys to the dust bin of treachery, and disqualifies them from making any comments on the conduct of the elected President of Sri Lanka, who believes he is putting in place necessary steps to protect the territorial integrity, sovereignty and the unitary status of Sri Lanka. 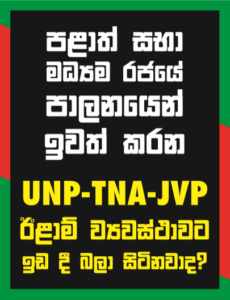 We urge the President of Sri Lanka not to blink whilst facing adversity and derogatory commentary from the bankrupt United National Front members and their impotent supporters, and hold general elections as planned. We also urge the President to consider going for a referendum under Article 86 of the 2015 Constitution, which empowers him to “prepare a submission of matters with national importance to people by referendum”, as detailed in page 64. May the President’s noble gestures prevail over the international coup d’état. National Joint Committee letter sent to the President regarding the handing over of the port of Trincomalee to the Indians.